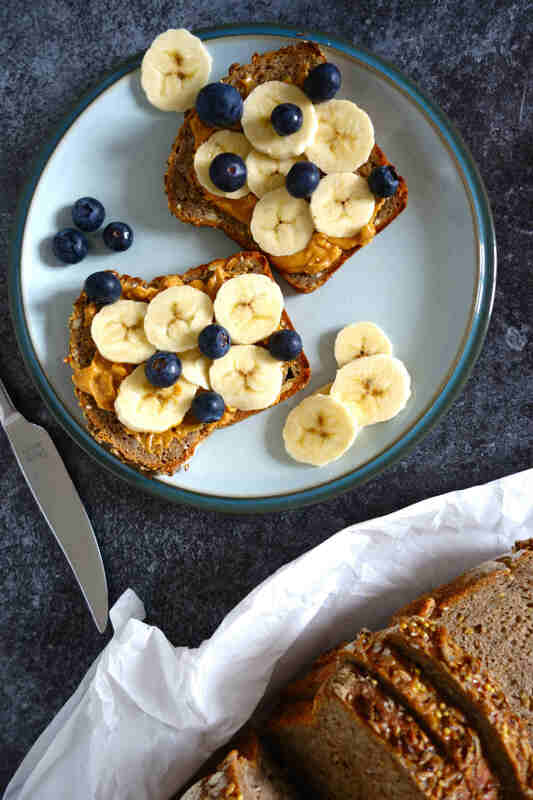 Toasted rye bread with nut butter and banana makes a delicious breakfast or afternoon snack. I like using almond butter, but the classic banana and peanut butter combination is also a winner. If you can’t get hold of chopped rye you can add an extra 40g of seeds instead. Chopped rye is traditionally used in pumpernickel bread, and adds some extra texture to your loaf. The sourdough starter adds a lovely depth of flavour, as well as contributing to the rise. This recipe also uses fresh yeast to make it easier for beginners to get the dough to rise, as 100% rye bread tends to be dense by nature. Rye dough is very sticky due to the nature of the grain, so don’t be surprised if it feels different to wheat bread doughs when handling it. A dough scraper is invaluable to keep the dough under control, and to prevent it spreading and getting stuck to your work surface. If you haven’t made a sourdough starter before, there is a chapter in my book which talks you through the steps, and a recipe on p.96 for a rye sourdough starter. I used our Shipton Mill organic light rye flour for this bread. About two hours before you want to start baking, place your chopped rye and seeds in a bowl of water to soak. When ready you’re ready to incorporate them to the mix, rinse and drain them through a sieve before using. Mix the water, starter and yeast together in a bowl, then add the rye flour and salt and combine. You will end up with a sticky dough due to the nature of the rye grain. Once you have a rough dough, tip it onto a lightly floured work surface and knead it gently to finish mixing the ingredients, making sure they are thoroughly incorporated. Transfer the dough to a bowl liberally dusted with rye flour and cover with a tea towel. Leave it to rest for 30 minutes. After this resting period, the dough will be easier to handle. Lightly oil a non-stick 900g loaf tin. Tip your dough on to a lightly floured work surface and add most of the chopped rye and seeds, keeping roughly 30g back to spread over the top. Shape the dough into a round ball, and cover with a cloth. Leave it to rest for 10 minutes. Shape your dough into a bloomer, using the palms of your hands to tap against the sides of it until it roughly fits the loaf tin. Use your fingers to flatten the bread gently into the tin, and spread your remaining seeds on top, lightly pressing them in with your fingers so that they stick. Cover with a cloth and leave to prove for one hour. Preheat your oven to 230°C (conventional). Create steam in your oven by placing a baking tray with around 12 ice cubes in the base of the oven. Place the loaf in the oven, and after 10 minutes, remove the ice cubes. Bake for a further 40-45 minutes. Cover the top of the loaf with tin foil for the last 15-20 minutes, to prevent the seeds on the top from burning. Check whether the bread is baked by inserting a metal skewer – if it comes out clean, the bread is done. Leave it to cool on a wire rack. Note – rye bread often slices better the day after baking. Toast your bread and spread with almond or peanut butter. Top with slices of banana and a few blueberries.